I'm not planning on giving up on it. I moved the seat forward a little today, about 3/4 of an inch. Felt good, have to ride farther to judge it. Recharged the onboard batteries with a new Hyperion 1420i charger, balance charged the whole pack at once. Took 6000 mAh to fill them up. Very nice charger. Readjusted the rear brake which had slipped a bit on the cable. It howls pretty loud when applied hard. But it works. 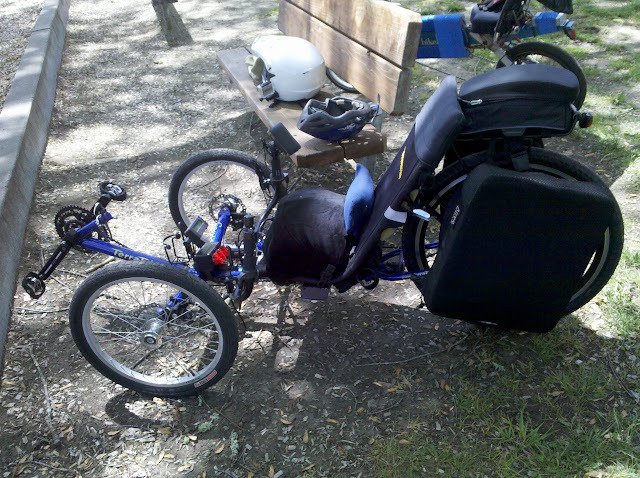 I've been wanting to try a recumbent for a long time after hearing about how easy they are on the riders rear end. I just rode a non motorized BikeE for the first time today and definitely have mixed feelings towards it. On one hand the seat was super comfy and I really enjoyed the reclined "easy chair" ride. The suspension on the rear was also a nice plus but once I started peddling the bike just felt a bit unstable. As I rode it more (2 miles max) I felt more comfortable but it always had a twitchy feeling at higher speeds. I honestly think after a good 35 mile ride it would be like anything I have ridden. Not sure if they all do but this one had the 3 speed internal hub and the 7 speed derailleur and I found it to be a dog. More of a slow speed bike. On my bike with 700 wheels, BMC V2 Speed and 75 volts I'm greeted with lots of wheelie inducing torque and 34 mph. Not sure I would want to put this motor in a 20" wheel and slow myself down that much but I'm sure it would pull a small car up a hill though. I guess I should look into one of the 700 wheeled recumbent bikes. Yours looks perfect. I picked up another piece of vinyl downspout material today, cut four 18" pieces off with the 120 tooth Oshlun blade in the chopsaw, and ripped them down to 2-1/2" wide using the bandsaw. This was much better than ripping on the table saw. I will paint them and downsize the battery pack soon to save six pounds and make it look a bit less hacked. I cut some aluminum with the new chopsaw blade and it is like a hot knife through butter. Very little noise or vibration and a clean cut. It looks like a mirror with a few scratches in it. Really nice for PVC and Aluminum. The sun came out for a few minutes and I took the readjusted bikeE for a quick spin around the neighborhood. It feels better with less reach to the handlebars and better contact with the seat. I'm also working on not gripping the bars much as is frequently recommended. It felt pretty good but it was a short ride. The weather this week is going to be wet so I'm not planning another commute run till it dries out and I get a few more things done on bikeE. "Is the stability of the bikeE similar to other bents? Can I do anything to improve it?" If you can handle the math. Bill Patterson did all the work, years ago. His work is spot on. Warren wrote: "Is the stability of the bikeE similar to other bents? Can I do anything to improve it?" The paper looks quite interesting. It would take a bit of effort to develop the spreadsheets to analyze the equations for the bikeE. It would be interesting to do. I'm sure I don't have enough time to do it at the moment. Here is another EbikeE that I built for my wife. Shot in the process of charging with the balancer attached (you can see bunch of white LEDs on the top of the battery). 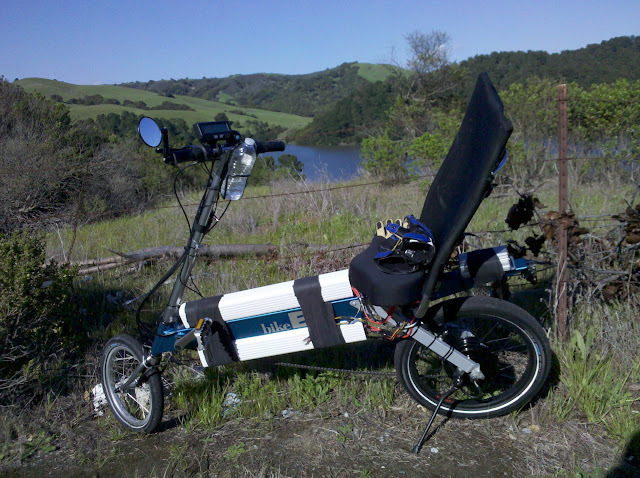 bike3: work in progress (slow), long range SWB touring recumbent, >1.5kwh pack TBD, Kelly KBS72101, likely HT35 hub, proportional regen. Nice, how does that front motor work out? Alan B wrote: Nice, how does that front motor work out? My wife rides slow and gentle, it is perfect for her needs. However when I try to ride it - the front spins when starting at full throttle (even on a dry pavement). Otherwise handling is not affected. Weather has been bad, turned nice today so I took the BikeE out for a spin. 15 miles along the road by the lake. They call it Dam road. Windy, but the BMC powers through it well. Makes about 20-24 mph up on the level and moderate uphills. The bike doesn't feel totally stable to me, but it goes where I want it to. Here's the view from this afternoon along Dam Road looking North across San Pablo Reservoir. Alan B wrote: Weather has been bad, turned nice today so I took the BikeE out for a spin. 15 miles along the road by the lake. They call it Dam road. Har! I love road names like that. I am impressed at your BMC. 20-24mph on that size wheel is excellent, especially since I think you are running 12S LiPo. In a 20" wheel, the 2810 will do 26 mph and the 2812 will make 21.5mph at 18S (72.5v nominal). Those are "freewheeling" speeds: you can reach that speed on downhills, and it's the point at which regen kicks in. Subtract 2 to 3mph for more realistic max speeds on flat and slight uphill. I've not disassembled my recumbent...yet. I'm using it as a test mule for voltage tests on both motors and on 20" vs. 26" wheels. dogman: "I bet if you just don't ride like a jerk, you can do whatever you want up to the speed where everybody looks at you like this. " tomjasz: "Romans go full dork. They could give a hoot what 'Merkins do." Lovely! That's adjacent to one of my favorite drives to take around home- through Tilden to Bear creek road, out and come back via Happy Valley road, then 24. I love the stretch of San Pablo Dam road west of Bear Creek road/Wildcat canyon, but then you're deposited in El Sobrante and end up taking 80 back, which is not as nice. These roads have nice wide washout areas but dang, folks tend to go pretty fast through there (guilty...) and lots of gravel and junk on the shoulders. Google maps reports something called "old san pablo dam road" which I haven't been able to find in the car- I would like to hunt for it with the GPS on the ebike... it looks nice. As well going all the way down Nimitz way is one I want to do soon. I think that would be really nice, particularly during a time when there is less foot traffic in the beginning part (weekday? morning?) I look forward to when I have a bike that is comfy enough and has enough range to take some nice rides in this area. Once I get my BMXish bike fixed up we should get together for a ride, I think! I'll have to ride it a bit more and figure out what the range really is... even with 1kwh on board the not amazing efficiency of the HS motor may limit the range to less than I was hoping... PaulD's bike should be more efficient... but as you know it needs work too and may or may not truly be a long-range cruiser! This morning I rode out the bay trail to Harbor Way in Richmond- then back Cutting to San Pablo, to Potrero up to the Arlington, back the Arlington to Marin and back home that way. Nice ride, about 18 miles Still haven't fixed my brakes or fork, or any of the other things that need attention. Beautiful weather today! Thanks for indulging my little "I love the bay area" stream-of-consciousness here... I like your bike it looks pretty solid! 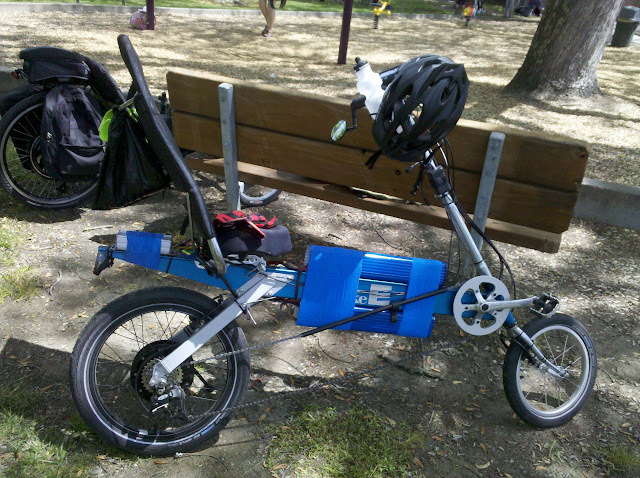 I would love to play around with a recumbent sometime as a comfy range bike! I've seen the old paved road along the lake, didn't know what it was called till now. I went right by it today. I think part of it is the road to the boat launch ramp, and I've driven that, used to fish in the lake, and from the water you can see the old road winding along. Haven't done that for years. My favorite commute route is from El Sobrante along the lake on Dam road and then up Wildcat through the park. 13 miles with lots of vertical. A good challenge for either of my ebikes. I used to live in San Pablo and commute via the Arlington a lot. Lovely drive. On my 40kw water cooled shaft drive v-twin. Hope those hands are feeling better. Ouch! That sounds like a wonderful commute route. Those are thoroughly enjoyable roads. My current commute route is 25 miles on 880 I would take yours in a nanosecond! The hands have been healing up real quick, thankfully. Chicks dig scars, or so I've been told. You can bet I was wearing gloves today, even with no intentions of crashing it. Thanks Justin of http://ebikes.ca for your amazing talents, dedication and contributions to ES! Thanks for the nice comments. Photo with Droid, I need a good way to carry the DSLR safely. The efficiency of this machine is amazing. 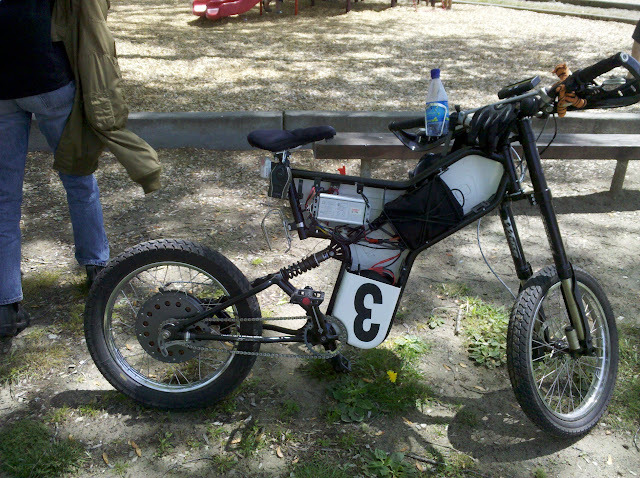 At 48 volts (12S Lipo) it went 16 miles on less than 8 amp hours at full throttle 20-24 mph with little pedaling and a lot of wind. At one point I was using 800 watts going slightly downhill! Max power was just over 1kw. This 12 Fet Lyen controller is dialed down to about 23A. I should tweak it up slightly to 1500W or so, but haven't dug into it. I read that a good rider on a recumbent beat four probably better riders in a peleton. So perhaps a recumbent is comparable to the efficiency of a peleton. Went on a nice ride yesterday with Stevil (who is helping me with my GreyBorg build) and his friend Josh from Sebastopol to Forestville. They have some nice bike paths in the area. Efficiency was 14.5 watt hours per mile! This is partly due to the slower pace of these paths and fairly level terrain. We compared the glide of the BikeE/BMC to a Terratrike/Magic Pie. At low speed (12 mph) the BikeE would gain on the TerraTrike on mild downhill grades. Power consumption on this ride was similar with the BikeE/BMC at 14.5 watt hours per mile and the TerraTrike/MP at 15.5 or thereabouts. Saw a few other BikeE's. Pretty popular bike! I tried putting the bikeE on my trailer hitch type rack, and IT FIT! I had to configure the wheel hoops on the outside, rather than staggered, but I could still probably get a Mountain bike in the other slot. This is very helpful. It would not have fit if it had been the longer wheelbase. So this worked out for me. This rack is the Swagman XC 2 bike trailer hitch type rack. Last edited by Alan B on Jul 13 2014 4:05pm, edited 1 time in total. Today I reconfigured the battery pack on the EbikeE. The pack was a bit long, preventing seat adjustments. The capacity was 12S 24AH which on this efficient machine was more than I generally need, and still not enough for a long ride. So I decided to reduce it to 16AH. I made some new PVC downspout covers and painted them a couple weeks ago. Today I installed them. It was getting dark so I'll take photos tomorrow, but it is lighter, cleaner and with the new colors of vet-wrap it looks better. Later I will make some type of extended pack for those long rides. Over this trip the BMX and Borg travelled a bit faster and more spirited, and the Tadpole and EbikeE a bit more lazy and smooth. On the downhills at low speed the EbikeE would go faster than the Tapole. At higher speeds the Tadpole would glide away from the EbikeE, so we could see rolling resistance (and cogging) vs air resistance in action. At the end of the trip the watt hours per mile were about 15 for the EbikeE and Tadpole, and 25-30 for the BMX and Borg. Not a precise A-B comparison, but interesting nonetheless. We also traded bikes a bit and Stevil, acuteaero and I got to experience the three uprights. Quite a difference and range of riding comfort and position. The BMX is small and harsh, even with the Thudbuster it is noticeable. A softer seat may help. The small wheels and short wheelbase is likely part of the cause. Tested out the Droid with Google's "My Tracks" software on my commute run. It collects GPS data and will export to Google Maps, Fusion, etc. It also analyzes the data. The data that was most interesting is the elevation gain. The gradients are not too accurate, it reported 15% one way and 20% the other. This was while driving a vehicle, perhaps it will be more accurate at the lower rate of a bike with the better view of the sky. At any rate this 13 mile commute has over 1200 feet of elevation gain in one direction, and 600 feet in the other. Alan B wrote: Over this trip the BMX and Borg travelled a bit faster and more spirited, and the Tadpole and EbikeE a bit more lazy and smooth. On the downhills at low speed the EbikeE would go faster than the Tapole. At higher speeds the Tadpole would glide away from the EbikeE, so we could see rolling resistance (and cogging) vs air resistance in action. Alan, thanks for the report & pic of your new Arrow Borg. I really enjoy all your posts that are so very detailed & analytical too. Heck, your posts are way longer than mine too! I love it! I've been focussing on the Borg lately, but the BikeE is still ready to go. Recently I took it on a camping trip and it raised some eyebrows and generated a few questions from fellow members in the RV club. A nice folding ebike would go over well there. Lately I noticed a new pannier rack made for the BikeE. It looks a lot better than my clumsy homemade one. 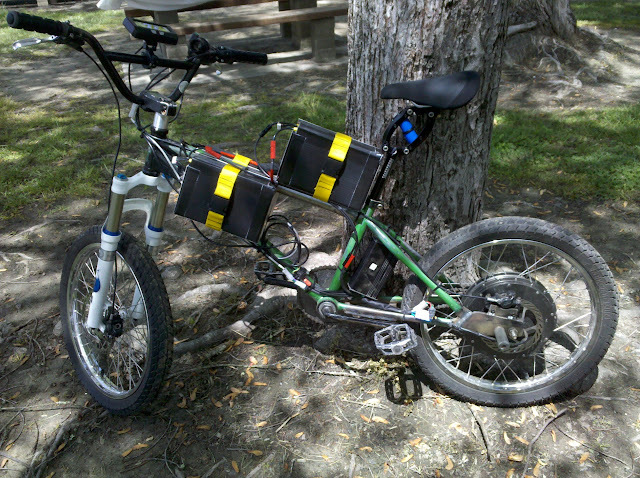 I need to carry 12 of the 6S 8AH Zippy batteries for the Enduro 100 mile ride, and I have 4 on the bike now, so I need four more on each pannier. This seems quite reasonable. Last edited by Alan B on Nov 03 2014 8:11pm, edited 1 time in total. I should add that the Vet-Wrap is great for short term use, but for long term it seems to lose its grip, at least the 3M variety. Lesson learned.